Darshan Trophy Season 3, Inter School and Inter College Invitational Knockout Football Tournament was kicked off today in the presence of District Minister Shri Satish Jarkiholi and Superintendent of Police Dr Ravikantegouda on 17th Aug 2015 at Subhash Chandra Ground (Lele Ground). Darshan Desai President Darshan United Football Club, Capt Balkrishna Desai, Director Darshan Group, Shrikant Desai, Director Darshan Group, Hiradevi Desai, Director, Darshan Group, Mugdha Desai, Director, Darshan Group were present for the function. Many of the dignitaries from Belagavi Vijay More, Izaz taked, Vijay Patil, Qais Noorani, Kaka Gojagekar, Bharat Deshpande, B. A Jadhav Police Inspector Tilakwadi Police Station, Venkatesh Sarnobat, Ramnath Sadekar, Sunil Bhide, Fazal Mujawar, Shakeel Attar, Sarala Herekar,Yogesh Kulkarni, Gururaj Mutalik, Ajit Siddannavar, Satish Gharge, Sachin Kallimani, Sangeeta Patil, Shaila Reddy, Vijaya Patil, Captains and coaches from school and colleges were also present for the function. 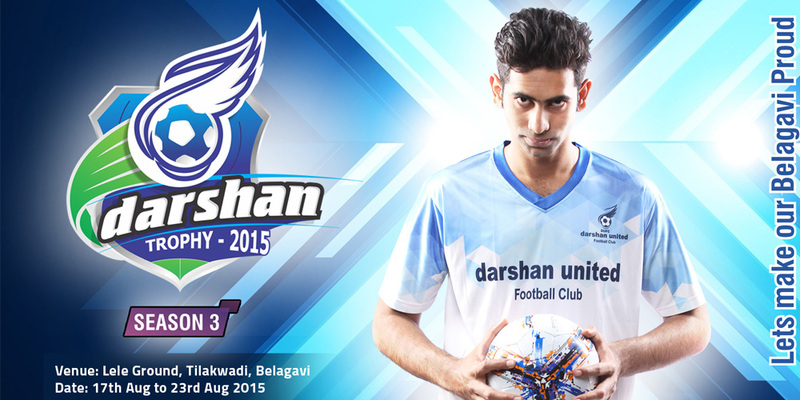 © 2013 Darshan United Football Club. All Rights Reserved. Powered by: Darshan Design Pro Pvt. Ltd.